Tammy Wilhoit, FNP is a board certified family nurse practitioner. 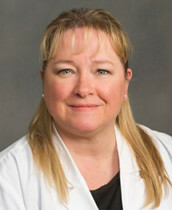 With 23 years of prior nursing experience, her specialties include long term care, primary care, urgent care, and trauma. Tammy received her undergraduate degrees from Walters State Community College and King University. She went on to complete her Master of Science in Nursing at King University. With devotion and compassion, Tammy looks forward to every patient encounter and feels blessed beyond measure to serve others in this advanced role. Outside the clinic setting, she enjoys reading, cooking, swimming, and spending time with her husband and three sons.